Garden Notebook – The Echinacea Explosion! 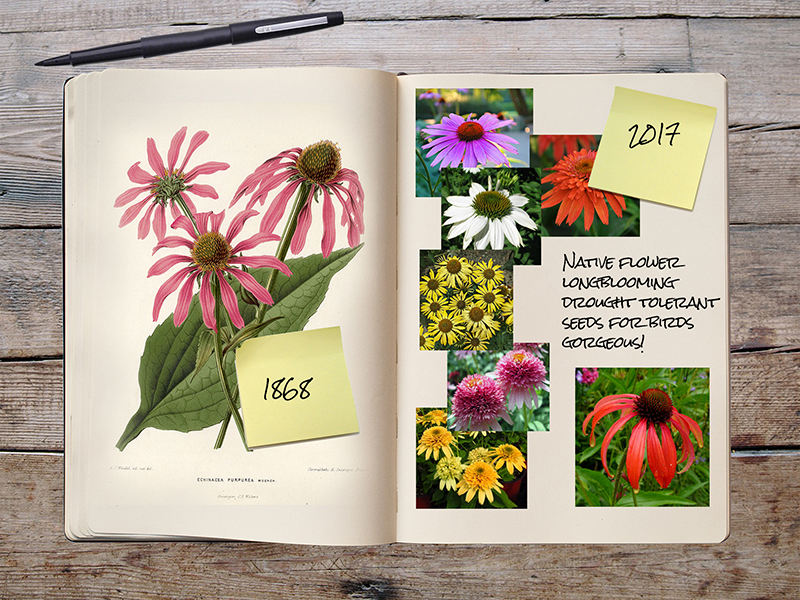 | Faddegon's Nursery, Inc.
Garden Notebook – The Echinacea Explosion! Jul 27, 2017 | Garden Tips, Perennials, Shrubs, Trees & Vines, What's New? Whether you call them coneflowers or echinacea, these stunning perennial flowers scream hot summer days in a staggering variety of colors. All hybrid coneflowers spring from our native echinaceas found by explorers in prairies and meadows across the country. In the 1990’s horticulturalists leaped into action resulting in now hundreds of available cultivars. The new coneflowers just keep coming in a huge range of colors, heights, and flower forms. Long-blooming, sun-loving, and tough, coneflowers have become one of the quintessential mid to late summer garden flowers. Plant in full sun and you will have beautiful drought-tolerant (water well the first year) flowers into fall and for seasons to come. Let the last flowers go to seed on the plant and the goldfinches will thank you! The original Echinacea purpurea is pinkish lavender in color, hence the common name, purple coneflower. In recent years the color has morphed into a range of pinks from soft to hot magenta. Look for ‘Solar Flare’, PowWow ‘Wild Berry’, and Double Scoop ‘Bubble Gum’. White is anything but purple! Apparently, white echinaceas are bred from plants that are naturally occurring and the new ones on the market are just fabulous. They are particularly elegant planted with lavender! Look for ‘White Double Delight’, ‘White Swan’, PowWow ‘White’, Sombrero ‘Blanco’, and ‘Happy Star’. The deeply saturated petals of red coneflowers are just eye-popping. These are hot colors and won’t disappear into the background by any means! Look for Sombrero ‘Salsa Red’, and ‘Tomato Soup’. Orange coneflowers compete with red coneflowers for that hot look but there are no losers here! Plant them both together for a vibrant treat. Look for Sombrero ‘Adobe Orange’, Double Scoop ‘Mandarin’, and ‘Tiki Torch’. So many to choose from in the yellow category. Whether you like single, double, or fluffy flowers, you’ll find what you want in the coneflower world. Look for ‘Cleopatra’, ‘Now Cheesier’, Sombrero ‘Lemon Yellow’, Double Scoop ‘Lemon Cream’ and ‘Maui Sunshine’. Novelty has come to the coneflowers! Breeding has continued to move along rapidly revealing truly unique colors and forms you won’t see in any other plant. Look for ‘Raspberry Truffle’, ‘Green Jewel’, and Sombrero ‘Hot Coral’.